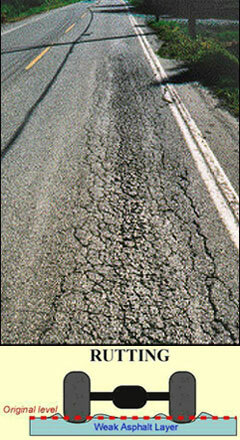 Asphalt pavements make up the majority of Australian highways and are routinely subjected to heavy repeated vehicle loads. Plastic deformation induced by cyclic loading can accumulate and cause various types of distress such as rutting, fatigue cracking, patching, depression and potholes of the road surface and subsurface. This greatly affects the serviceability of roads. In other cases, it is found that the road material undergoes plastic deformation for the first finite number of load cycles, but thereafter only suffers elastic strains so that no further permanent deformation in the pavement is induced. This behaviour is referred to as 'shakedown'. While large-scale permanent damage is unwanted, shakedown behaviour is obviously a desirable feature that provides a rational means for pavement design. Existing research in this area, however, is far from satisfactory and much effort is still needed to further our understanding of shakedown and failure behaviour in asphalt pavements. In this project, we employ shakedown theorems and modern computing tools in an attempt to accurately determine the shakedown limits for road materials, and to reasonably interpret the various failure mechanisms occurring in pavements. This research will be beneficial for designing asphalt pavements safely and economically, and help to improve the performance of existing roads in Australia. The Mohr-Coulomb criterion is employed to characterise the yielding behaviour of cohesive-frictional soils. The sliding and rolling contact between vehicle wheels and the pavement surface can be approximated by either a Hertzian contact or a trapezoidal pressure distribution in plain strain deformation. 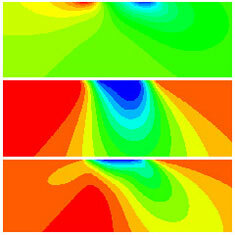 Exact elastic stress fields are firstly obtained. Figure 2: Hertizan (a) and trapezoidal (b) contacts between vehicle wheels and pavements. Melan's shakedown theorem is then implemented to calculate the shakedown limits. The shakedown analysis is mathematically equivalent to the following optimisation problem where the yield constraint on the residual stresses has long been neglected in past research. 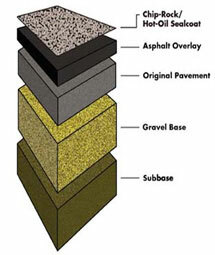 While it is simple to assume that the material under the vehicle wheels is homogeneous, a more realistic model should consider the different layers with variable physical properties across the pavement profile. This is currently under investigation. By assuming a homogeneous soil profile in the half space and plain strain conditions, shakedown limits have been obtained for both Hertzian and trapezoidal pressure distributions. 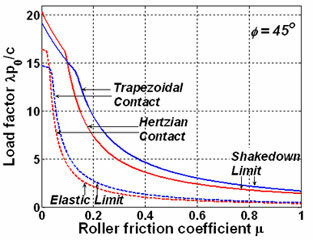 Fig.4 shows the elastic stress distribution for the trapezoidal contact case. The shakedown limits are depicted in Fig.5 for both contact types against their respective elastic limits. Equal total forces are applied to the two contact types to make the results comparable. It is found the shakedown limit obtained for the trapezoidal contact case is smaller than that for the Hertzian approximation when subsurface failure is critical. When surface is critical, this trend is reversed.